The nearly 34-year-old bird of prey had cuts on a wing, likely from a fight with another eagle. Maine game wardens have rescued the oldest bald eagle – nearly 34 years old – ever documented in the state. 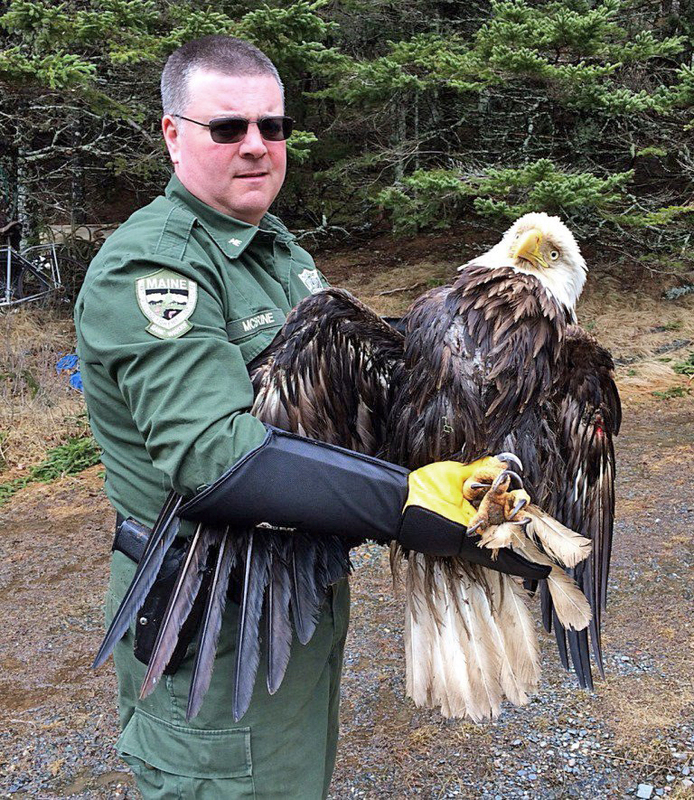 Game Warden Joe McBrine got a call on Friday about an injured bald eagle in Trescott, a township in Washington County, said Mark Latti, a spokesman for the Maine Department of Inland Fisheries and Wildlife. McBrine, who was attending a career fair when the call came in, asked U.S. Fish and Wildlife Service Officer Amanda Hardaswick to help him since bald eagles can be difficult to handle. An eagle’s wingspan can reach up to 7 feet. With the help of a local lobsterman, Wayne Jones, McBrine located the injured bird along the harbor shoreline. Cuts on its injured wing were consistent with its having been in a fight with another eagle, wardens said. “McBrine was able to walk right up to it and capture it without any struggle by the eagle,” Latti said in a statement Monday. Latti said that makes the eagle nearly 34 years old. “It is the oldest eagle ever documented in Maine,” he said. A volunteer drove the eagle to Avian Haven in Freedom, where it will recover from its wing injury. The eagle will be released into the wild once its injury has healed. Avian Haven says three bald eagles, including the one rescued in Trescott Township, were brought to its facility on Thursday and Friday. All of the eagles had elevated lead levels in their bloodstreams and each appeared to have been seriously wounded in “eagle combat,” Avian Haven said on its Facebook page. The other eagles were found in Arrowsic and Brunswick. Eagles in the wild generally only live to be between 15 and 20 years old. Latti said the resurgence of the bald eagle in Maine is one of the more remarkable conservation stories. In the early 1970s, bald eagles were endangered and there were less than 30 nesting pairs in the state. Eagles in Maine are no longer endangered and the state estimates there are now more than 900 nesting pairs here.